When I asked my dad what he wanted for his birthday he simply said, "Socks." Given that he is terribly practical, I didn't think much on it and figured that a trip to the local sportsman's store would suffice. Exactly one week before his birthday it dawned on me: Oh my god. He meant he wanted a pair of knitted socks! With only a week to spare, and very little time to knit, I whipped up and knit these quick and simple socks. The addition of the seed stitch "ribbing" gives dimension to the variegation of the yarn, while ensuring that you won't go insane from boredom. Working with double-point needle instructions can be found here. Grafting instructions can be found here. Round 2: [K3, p1] to end. Repeat these 2 rounds for Seed Stitch Rib. Row 1 [RS]: [Sl 1, k1] to end. Row 2 [WS]: Sl 1, p to end. Repeat these 2 rows for Heel Stitch. Slipped sts are slipped purlwise. CO 44 sts. Divide sts evenly between needles, place marker and join to begin working in the round, being careful not to twist. Work in 1x1 Rib until work measures 1 inch. 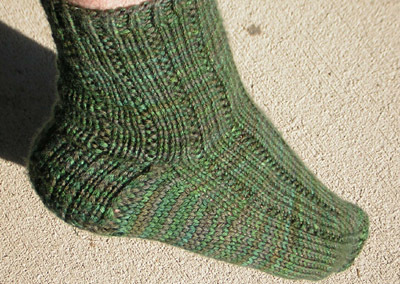 Work in Seed Stitch Rib until work measures 6 inches, or desired length to top of heel, ending with Round 2 of Seed Stitch Rib. Next Round: Work 22 sts in Heel Stitch, working all these sts onto one needle; the heel flap will be worked back and forth on these sts. Leave rem sts on hold on 1 needle. Work 21 more rows in Heel Stitch (ending with WS row). Row 9 [RS]: Sl1, k11, ssk. Row 10 [WS]: Sl 1, p10, p2tog. 12 sts rem. K all heel sts; with same needle, pick up and k 11 sts along side of heel flap. This needle will be designated Needle 1. K 22 held sts onto one needle. This needle will be designated Needle 2. Using a third needle, pick up and k 11 sts along rem edge of heel flap, then k first 6 sts from Needle 1. This needle will be designated Needle 3. Next Round: K to last 3 sts on Needle 1, k2tog, k1; work all sts on Needle 2 in Seed Stitch Rib as set; k1, ssk, k to end of Needle 3. 2 sts decreased. Repeat these 2 rounds 5 times more. 44 sts rem; 11 sts each on Needle 1 and Needle 3, 22 sts on Needle 2. Cont in patt as set, working sts on Needle 1 and Needle 3 in stockinette st and sts on Needle 2 in Seed Stitch Rib, until work measures 2 inches less than desired length. Toe Shaping Round 1: K to last 3 sts on Needle 1, k2tog, k1; k1, ssk, k to last 3 sts on Needle 2, k2tog, k1; k1, ssk, k to end of Needle 3. 4 sts decreased. Toe Shaping Round 2: K all sts. Repeat these 2 rounds 6 times more. 16 sts rem. K sts from Needle 1 onto Needle 3. Break yarn, leaving a 12 inch tail. Graft sts on Needle 2 to sts on Needle 3. Weave in all ends on inside of sock. Wash in lukewarm water with mild detergent and block lightly. Bobby taught himself to knit roughly 2 years ago from a cheap Learn to knit book from a local craft store. 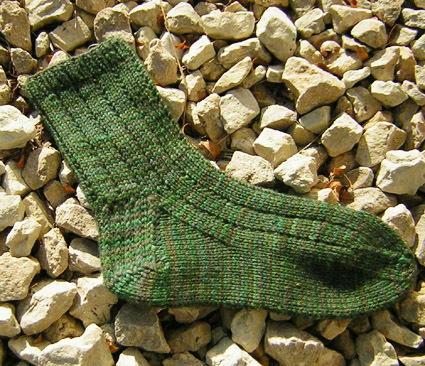 Of all the items there are to knit, socks are his favorite because they offer instant satisfaction and are a project that can be carried anywhere. Living in the Midwest where there are only 2 seasons (Road Construction and Winter), warm socks always come in handy. When he's not knitting, he can usually be found mixing, or researching, herbal formulas for friends and family that have need of them for one reason or another. Read more at his blog.